Business lawyers are essential for commercial enterprises to ensure that they remain knowledgeable of the laws regulating their business and protecting their assets from liability. A business lawyer can also help you clear up ambiguities in existing business agreements and protect employers from employee lawsuits. Instead of searching online or in the Yellow Pages, the best practice is to consult a State Bar directory. This will give you the best range of choices and you are almost guaranteed that members of the State Bar adhere to ethics codes and are up-to-date on legal matters concerning their specialty. It can be particularly difficult to find a skilled business lawyer, but many other businesses and lawyers in other specialties will be able to provide you with referrals to a reputable commercial lawyer. You will almost certainly need a specialist. Although it is a branch of civil law, business law is very complex and not all lawyers are knowledgeable enough in the field to provide the best service. Like all lawyers, business lawyers must a have a degree from an accredited law school and pass the bar exam. The lawyer may have taken a specialty in law school that has prepared him or her to become a business lawyer. In addition, many jurisdictions will offer classes and trainings to keep lawyers up to date on changes to the civil code and certify them to practice business law. One should look for a lawyer with a proven record of guiding clients through commercial law proceedings and rendering services. Check the lawyer’s credentials to make sure they come from an accredited law school and that the lawyer is a member of the state bar association. Advertising and name recognition are not always hallmarks of good lawyers and should never be used when evaluating the merits of hiring an attorney. You will entrust this business lawyer with personal and confidential information, so it is essential that you have a bond of trust with this lawyer and that he or she abides by a professional code of ethics, usually set by the bar association of that jurisdiction. It is also important to get all agreements in writing including disclosure of fees and agreements. Communication is also key to maintaining a solid client-retainer relationship. Many business lawyers will give you a direct number to reach them at if you have any questions or concerns about your case. If an attorney makes it difficult to talk or meet with him, you may want to reconsider your decision as a lack of communication may jeopardize your settlement. For most jurisdictions, lawyers must pass ethics examinations and abide by an ethics code set by the bar association. Still, you must be vigilant when dealing with some lawyers that lack a solid record of integrity and ensure that your dealings with them are fair and transparent. Be aware of unreasonable fees, illegal activity or coercion on the part of the business attorney. Bar associations maintain dispute resolution and grievance services for clients that have issues with their business attorney. Before meeting with a lawyer to perform any aspect of business law, one should gather relevant information about their business, such as a list of liabilities, partners and intellectual property so that the lawyer can assess which services you need. 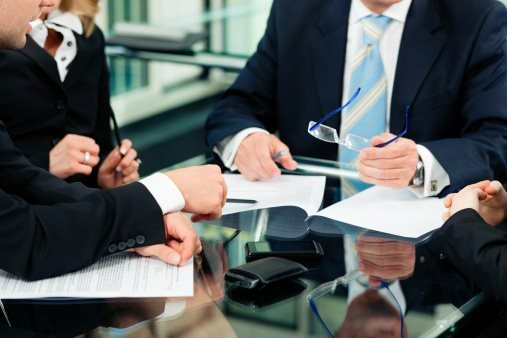 For those seeking a specific legal service, such as drawing up the paperwork for a lower liability corporation (LLC), the client is best served by understanding the details of the paperwork he or she wants filed so as to save on hourly fees that might be accrued while having the process explained by the lawyer. Still, the lawyer will be able to explain any aspect of commercial law that is unclear to the client, as well suggest useful steps the business interest can take to limit liability and protect investments. For the purposes of business law, commercial enterprises will need lawyers especially for the creation and enforcement of contracts, partnerships, renting and leasing agreements and other legal documents. For most businesses that cannot afford to keep a lawyer on dedicated retainer, the best and most popular option is to pay the business lawyer a flat fee for performing legal services. While consulting a business lawyer, hourly rates may be accrued from using the lawyer or support staff such as paralegals. There may be other fees for creating and copying documents as well as filing them with the proper authorities. It is especially important to be aware of those fees. Can you help me assess potentially liabilities in my business? Am I protected against a potential lawsuit by my employees? Quicken Business Lawyer is a software from Intuit Inc. that helps new businesses with forms and legal advice they may need when starting up. Quicken Business Lawyer is currently sold until the retail name Quicken Legal Business Pro and also helps businesses manage finances, create form letters and manage books. Quicken Business Lawyer is marketed as an alternative to costly lawyers that will charge by the hour and promises to provide the same quality of service. Quicken Business Lawyer can be obtained through a number of retail locations. Business law lawyers are essential for any business, especially startups, which want to ensure that their dealings are fair and legitimate. A business law lawyer can also help create documents such as employment contracts that are legally sound and free of violations. Business law layers also examine preexisting documents for loopholes and potential liabilities so as to protect their clients from litigation. Some law firms will specialize in business law layers, but a great many will accept new clients through referrals from other legal professionals. In this way, a trusted layer can link a client to a trusted business law lawyer through a network of professional relationships. A business may choose to keep a business law layer on retainer if the business needs to create contracts or other legally binding documents frequently. For all others, seeing business law layers on an hourly basis or paying the business law lawyer a flat fee to produce documents may be preferable. Many businesses will develop a strong relationship with their business law lawyer, which is important as this lawyer will handle important and confidential information, which makes discretion and trust important for client-retainer relationships. When dealing with business law lawyer fees, ensure that you are aware of not only the cost of service fees, but also ancillary fees, such as the use of a paralegal or document copying fees. A business formation lawyer is important for new companies that want to ensure that their business is legitimate and legally sound. The aid of a business formation lawyer can help you formulate a lawyer business plan that will reduce potential liabilities from employee or customer lawsuits. The business formation lawyer can also help with code violations on premises and fighting said violations in court. Most importantly, with a lawyer business plan, you can enjoy the security of legal solvency, which will prevent most worries of business owners, leaving them time to consider business expansion and entrepreneurial pursuits. Business formation lawyers are instrumental in the formation of corporations, particularly LLCs (lower liability corporations) and L3C corporations that are used by non-profit organizations to invest on behalf of the public good. The business formation lawyer can assist with the formation of these entities, for the purpose of ease and compliance with state, local and federal laws and regulations. Lastly, a business formation lawyer can help a client assess the tax code to find potential loopholes, exemptions, deductions and advantageous ways to receive a favorable tax rate, such as incorporation. Adhering to the lawyer business plan from a trusted business formation lawyer is critical for the success of new businesses hoping to avoid crushing liabilities. Work as a business lawyer can be lucrative a typical business lawyer salary can be rather high and incentivized with bonuses, profit sharing and commission. Large law firms will offer the best business lawyer salary but private practice layers can also maintain a lucrative enterprise through a broad base of clients with varying commercial needs. The government too, hires business lawyer and this business lawyer salary will often include generous government benefits and employment stability. Other factors affecting business lawyer salaries include experience, professional specialization, geographic location, and firm reputation. The business dispute lawyer maintains a critical role in commercial law. Commercial disputes are incredibly varied in nature so the role of the business lawyer can vary from mediator to representing either of the parties in the dispute. For the purposes of commercial dispute mediation, the business lawyer must assess the weight of the arguments and depending on the form of dispute resolution previously agreed upon, offer binding or non-binding advice or rulings on the rights and liabilities in a dispute. The business dispute lawyer in this situation plays the role of impartial observer and is generally chosen and accepted by both parties. The parties must decide in advance if the lawyer’s decision is legally binding and abide by the settlement agreement, usually composed and verified by the business lawyer himself. The lawyer can be paid through retainer fees and in some rare cases, flat fees for this purpose. In other situations however, the business lawyer may be needed to represent a party in a commercial dispute. The matter might be complicated and involve a number of laws and regulations, requiring the services of business dispute lawyers. The business lawyer will present the client’s case in court, drawing evidence from legal documents and precedent. In this case, as expected, judgment is reserved for the jury or arbitration panel and these decisions are binding. In the aftermath of litigation, business dispute lawyers can help a party comply or for compliance with court orders from the other party. Lawyer business cards are relatively easy to print and are essential tools for any lawyer. A typical lawyer business card will have the name of the firm displayed prominently, followed by contact information, especially a fax number so that clients can send important documents and information to the law office. There are a number of online and physical locations that will customize and print lawyer business cards, in bulk. Business cards for a lawyer are essential networking tools that can attract potential clients and cultivate professional relationships. As professional relationships are critical in the legal profession, every professional should have lawyer business cards as an easy method of proving contact information to other lawyers. In this way, professional relationships, which often lead to referrals, are cultivated which will help private practices immensely. There are many different types of lawyers, some of which are business lawyers and who work at corporate law firms. They concentrate on a certain area of law that includes incorporating businesses as well as making sure that their taxes are paid properly. A business lawyer is one that represents business. A corporate law firm is one that will represent corporations and their interests instead of individuals. In some cases, a corporate law firm can be one that is founded in a corporation itself. A large corporation has their own business lawyers who work for their corporate law firm. Many large companies have corporate law firms that work specifically for them as well. Those who are business lawyers in large corporate law firms may handle only one client and their interests in particular. Most of the business lawyers who work for large corporate law firms will also work defending patent and trademark law as well. The corporate law firm should be able to provide a business lawyer for all of the needs of the corporation. Business lawyers who work in a corporate law firm may be required to be licensed in all areas of the law, including patent and trademark. A business lawyer is one who represents businesses instead of individuals and can usually be found in corporate law firms. These include those who work with litigation matters, such as insurance company representation as well as other litigation matters and tax matters for large as well as mid sized corporations.